Just as the name suggests, a beamsplitter is an optical component used to split an incident beam of light into two separate parts. Though cube beamsplitters, coated on all faces are used for applications requiring a rigid beamsplitter, the commonly used beamsplitter is simply a plate of glass or plastic oriented at 45 degrees (with respect to the incident beam) and coated with a dielectric stack of materials. These beamsplitters are smaller, lighter and less expensive than cubes. In the case of a 50/50 beamsplitter, a dielectric coating is optimized so that the element both transmits and reflects 50% of the light through a given wavelength range. When designing an optical element that requires an optical coating like a beamsplitter, the addition of an anti-reflection coating can be beneficial to the end user. In fact, most off-the-shelf beamsplitters come with an anti-reflection coating to reduce stray light, as shown in Figure 1. 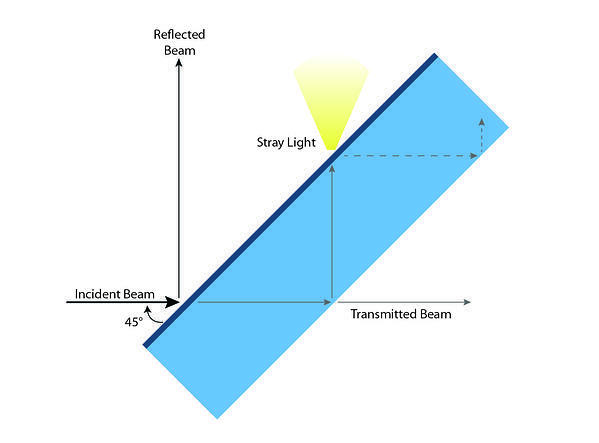 Figure 1 shows how a beamsplitter without an anti-reflection coating produces stray light parallel to the reflected beam. The beamsplitter coating, represented by the darker blue face, is optimized so that the intensities of the reflected and the transmitted beams are equivalent. On the uncoated side, we pick up approximately a 4% reflection from the glass/air interface. When this reflected light reaches the beamsplitter, about 2% of it passes through and becomes stray light. This continues to happen as seen in the dotted lines, but the intensity becomes so low that it is not a major contributor to stray light after the initial reflection. Sometimes this stray light is referred to as “ghosting” because it produces a faint replica of the reflected beam. The addition of an anti-reflection coating on the back side of a plate beamsplitter can significantly reduce the ghosting effect. Consider a broadband anti-reflection coating on the backside of a beamsplitter that reduces the reflection at the glass/air interface from around 4% to under 0.5%. In turn, this cuts down on the stray light by a factor of 8. That is why anti-reflective coatings and beamsplitters are so often coupled together to produce an optimized optical element. For an in-depth look at anti-reflective coatings, download our eBook today.